Lock in a great price for Mutu Village - rated 9.2 by recent guests. 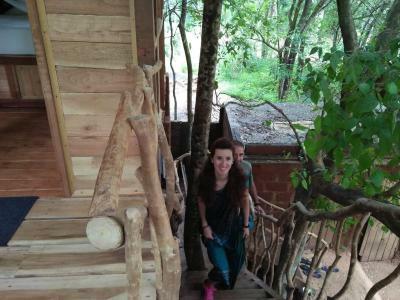 The tree house accommodation with open air bathroom was superb. Something a bit different and a fantastic experience for all the family. Authentic breakfast and dinners were best we have had in Sri Lanka. Great hosts aswell. 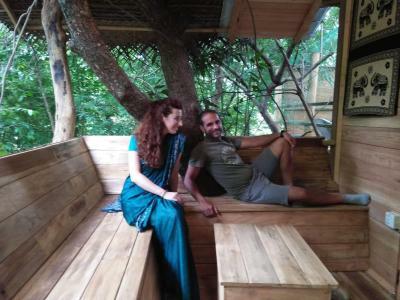 Loved the tree house we stayed in the inn on the tree which was excellent. 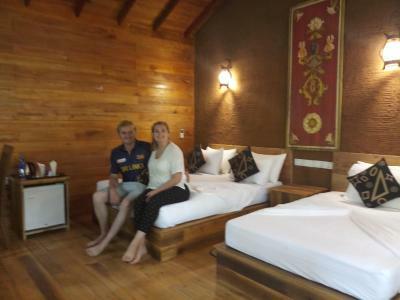 Great air con which was needed for our stay as it was 34° Good food and owners and staff helpful. Wow! Such a wonderful place. Friendly and helpful staff, beautiful buildings too. Breakfast and dinners the most delicious food too. Stay here for sure !! 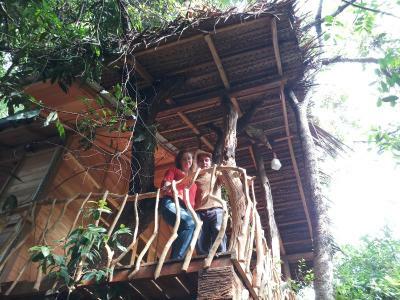 Great tree-houses with wooden balconies. Good food and a very helpful host. The hospitality , service and overall feel to the property . The owner and all the staff were very helpful and the food was delicious and authentic Sri Lankan. Our room was very new and had an outside shower and bath under the trees. Wonderful local cuisine and good service. Recommend the new Ayurveda spa facility. Character of the rooms . Helpful staff and community philanthropy. The owner and his wife and daughter were very friendly and welcoming. They showed us to our room after giving us tea. The home-cooked dinner and breakfast were absolutely delicious! 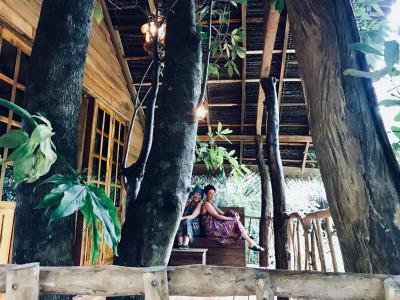 Our bedroom was a spacious hut on stilts among the trees with a lovely big balcony and a gorgeous semi-outdoor private bathroom. In the evening the monkeys swung past us on their way home. 15 minute walk into town to buy beers, trinkets if you wanted. The owner helped us organise a (very nice) car to visit Sigiriya and Dambullah. We loved Mutu Village! 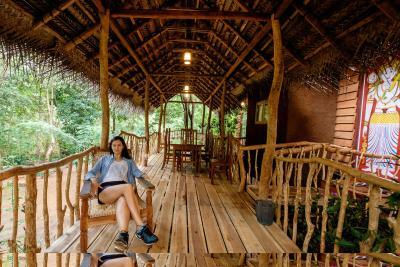 The accommodation in the tree houses is fab and so spacious. Lovely having an outdoor shower listening to the birds. Ajith was very helpful arranging trips and transport for everything we wanted to do in the area (good base for cultural triangle). Mutus breakfast and dinner were amazing! One of our bestsellers in Habarana! 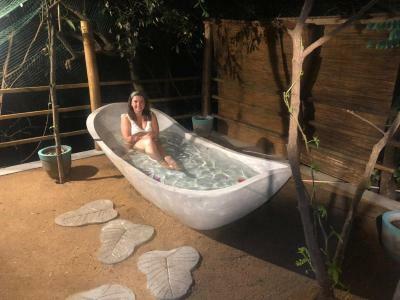 Located in Habarane, Mutu Village features a garden with barbecue facilities and offers rooms with satellite TV and private bathroom 550 yards from a local bus stop. Laundry facilities and newspapers are available at the property. Rooms at Mutu Village are equipped with tiled floors and ironing facilities. The private bathroom comes with a shower, a hairdryer and free toiletries. Several restaurants and cafés are located within 15 minutes' drive. 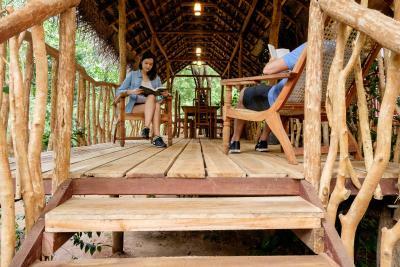 The accommodation can provide guests with suggestions and information on nearby eating facilities. The Minneriya National Park is 15 minutes' drive from Mutu Village and the Echo Park is 6.2 miles away. The Kaudulla National Park is 30 minutes away by car. Habarana Train Station is a 10-minute drive away. 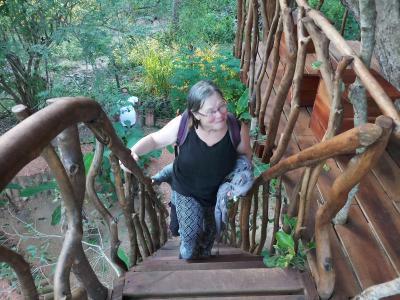 Mutu Village has been welcoming Booking.com guests since 4 Nov 2013. When would you like to stay at Mutu Village? This air-conditioned room has views of the garden and ironing facilities. It includes a private bathroom with a shower, a hairdryer and free toiletries. 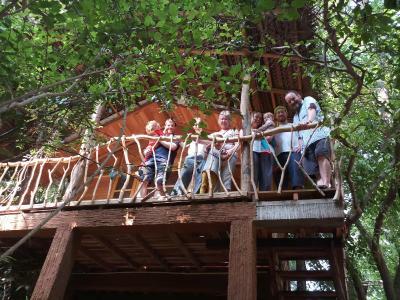 This air-conditioned tree-house has views of the garden, seating area and ironing facilities. It features a work desk, dining area and minibar. It includes a private bathroom with a shower, a hairdryer and free toiletries. 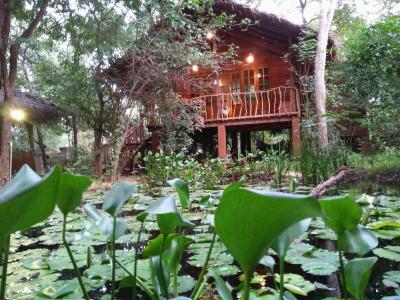 This wooden luxury bungalow features a private balcony, air conditioning and seating area. This suite has a sauna, spa bath and private entrance. This double room features a private entrance, air conditioning and electric kettle. We are providing comfortable accommodation for your tire full journey to make silence your mind under the calm & quite rural village environment. Those are fully equipped with all the modern facilities. House rules Mutu Village takes special requests - add in the next step! Mutu Village accepts these cards and reserves the right to temporarily hold an amount prior to arrival. Power cuts happened often as authorities shut it off to help save energy. No fault of owner. 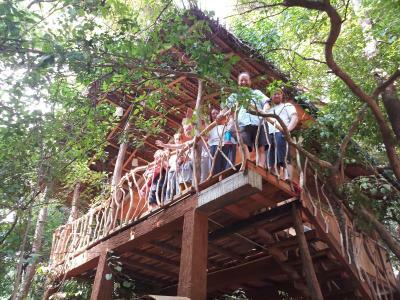 Some building work was going on to increase number of tree houses which if you were not out sightseeing gave us some concern as to no piece. Very good at organising transport and visits but could give greater clarity on the details and price of excursions, spa treatments etc at the start. Couldn't have been better! The wifi was a little slow if I am being super picky, but it really was lovely. No alcohol license but you can bring your own from the local shop to have with dinner. Location is a bit set back to no area of restaurants/bars etc but not needed as food is amazing at Mutu. Great location with an outstanding room and an even more amazing bathroom. The host was really kind and helped us to organize trips around the area at a convenient price. 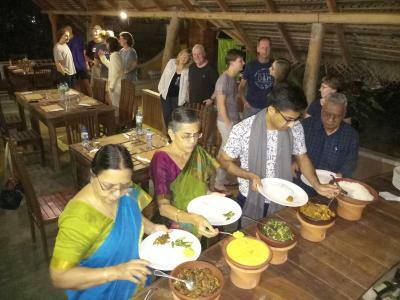 The breakfast and the dinner were one of the best of our whole stay in Sri Lanka! This was one of the best experiences in Sri Lanka. Close to all the cultural areas it’s the perfect place to stay. 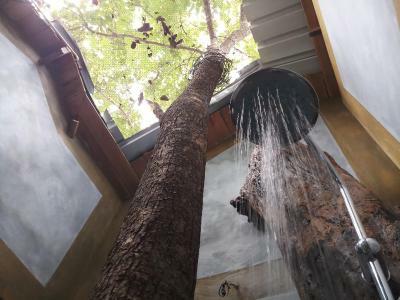 The air conditioned tree house was very comfortable with an amazing shower area. If you stay you must have dinner at the Mutu village, the chef serves up some amazing Sri Lankan dishes and In fact this was the best food I had eaten during my 2 week trip. Host was incredibly helpful with booking excursions and provided great information. This place is a must to anyone visiting the habarana region and wants to have a different experience. Breakfast amazing as well as dinner ! The staff is perfect ( helpful and welcoming) Great rooms and very clean. Initially a little difficult to find. 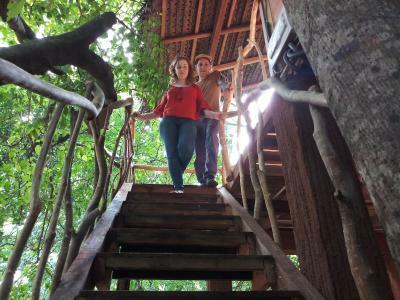 Loved the tree house we stayed in, immaculately clean and well presented. The food (evening meal and breakfast) was outstanding and evening meal well priced. Staff were very friendly and informed, will definitely stay here again if we visit the region. Loved every minute here.